Episode 20| Who Hurt You? Mayi discusses the baggage that we bring into new relationships. Mayi discusses whether or not opposites attract. How important is it to have common interest? Today Mayi discusses how trust is the foundation for a good relationship. Today we discuss the bigger commitment, having children. Mayi cautions couples about having children before marriage. Hopefully your mate is supportive??? Today Mayi discusses the "Pink Elephant" of relationships. What important negative personality traits are you ignoring? Today Mayi discusses the importance of creating relationship boundaries. 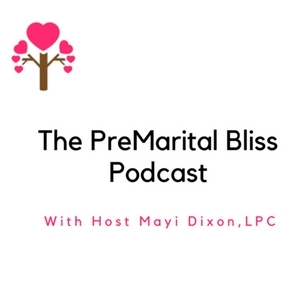 Today Mayi discusses the concept of granting marital privelege to those who are not married. Either we are married or single, what are the consequences of giving husband or wife priveleges? Mayi discusses the importance of date night. Couples make sure that you schedule time to connect and bond. This tradition should start before marriage and continue on into marriage. Today we discuss the importance of choosing a mate. It is important to discuss long term expectations at the begining of the relationship. How to prepare for marriage if you are in a long distance relationship. Today we discuss how to identify emotional maturity. Episode 2 | Are you ready?